Welcome to Question Corner with Teacher & Gordo. In these posts, you will learn useful information regarding CodeMonkey’s different content and courses. Each post will include questions from Teacher with answers from Gordo, CodeMonkey’s smartest friend. This week, you will learn all about CodeMonkey’s Frogger Course. Enjoy! Hi Teacher! Did you hear about the Frogger Course? Hi Gordo, actually yes, but I am not so sure what it is. Can you tell me more? Yeah, of course. Frogger is one of the three current Game Builder courses that help prepare students for the free-form Game Builder platform. These courses provide students with an interface that allows them to then build their own games. This specific course revolves around creating a touch-screen game. Wow. So after completing this course, I have all the tools to create a touch-screen game on Game Builder? Yes, however you also need experience in coding with CoffeeScript. So after you complete the Coding Adventure and Frogger courses, you will acquire all of the necessary skills needed to design touch screen games. What commands do you learn in Frogger? In this course, students use the onSwipe command instead of onKey. This tells the computer that swiping the screen should move the frog in a given direction rather than pressing a key. What ages is Frogger for? Although we recommend Game Builder for ages 12+, we have seen a lot of success in 10 year-olds creating their own games. Students as young as 8 can successfully complete this course and go on to create intricate and well-designed games. What are the prerequisites for completing the Frogger course? In order to successfully complete this course, students first need to learn to code with the Coding Adventure. Game Builder requires completion of the Coding Adventure since before you can create with code, you must first be able to code. How many exercises are there and how long does the course they take? There are 30 exercises in the Frogger course and it roughly takes 2-4 hours to complete. 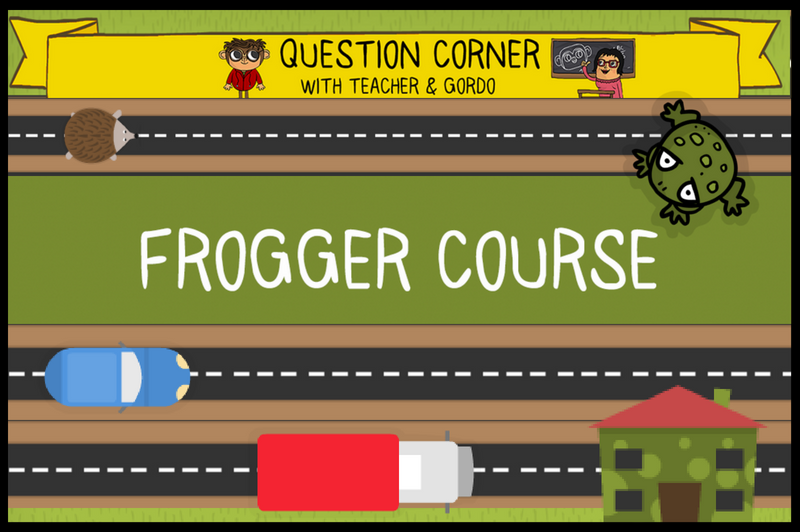 As a teacher, do I need special experience to introduce Frogger course to my class? No, you do not! The Frogger Course includes step-by-step instructions so you do not need to have previous game design experience in order to get your students started. Where can I see my student’s progress within this course? One last question, do I need to pay extra money for Frogger? If you have a Game Builder subscription, Frogger course is included. To view prices for Game Builder, view CodeMonkey’s pricing page. Any more questions on the Frogger Course? Feel free to ask in the comments section below!